as red earth and pouring rain. From The Kuruntokai, translated by A. K. Ramanujam. “We must go to Angkor Wat,” insisted my husband. Visions of a sole crumbling monument arising out of dense jungle (in which landmines left by the Khmer Rouge were sure to explode) clouded my mind, and I steadfastly refused to entertain the idea for two years. Eventually, a little bit of reading helped to dispel the ignorance and fear. The Cambodian e-visa process was so simple, we couldn’t believe it was genuine. Angkor Wat, the most famous monument in the historic area outside the Cambodian city of Siem Reap, is only one of several sites of interest. 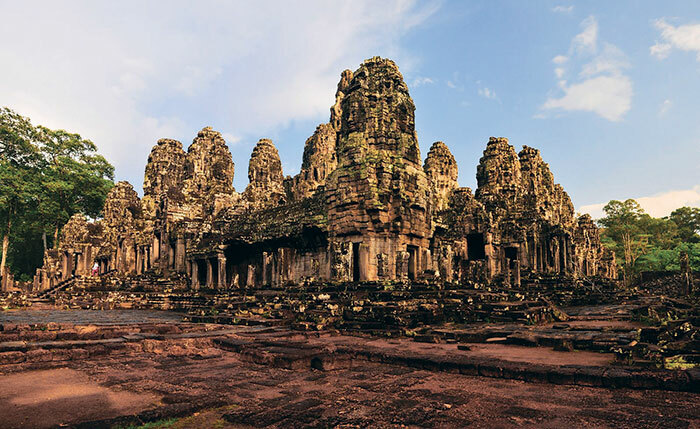 Angkor (the name derives from the Sanskrit word nagara) is a UNESCO World Heritage Site. Some of the ruins have been restored several times and some await restoration. Rouluos, where King Jayavarman II, founder of the Khmer empire, established his capital Hariharalaya, named for Vishnu and Shiva, is a good place to start. This is where the first great temples of the ninth century were built and it sets the stage for later Khmer constructions. Preah Ko (sacred bull), is named after Nandi, Shiva’s steed, statues of whom are in front of the temple. The sun-warmed snouts of the bulls just beg to be petted. Bakong was the first temple constructed like a mountain, representing Mount Meru. Lolei stands in the middle of a now dry baray (reservoir), Indrataka. 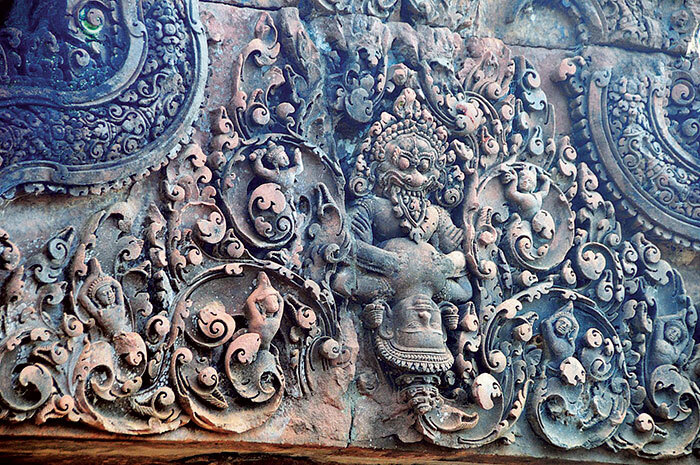 While much has been lost, all three temples retain some beautiful lintel carvings. We had arrived at the start of the monsoon in May when there are fewer tourists. The Rouluos group receives fewer visitors anyway, and they are a gentle introduction to jet-lagged souls who may need to do a lot more walking later. Thunder showers are usually brief. We experienced our first storm at Rouluos, where, standing with my husband by the old temple walls, waiting for the storm to pass and watching the red soil flatten under the impact of the water, I could not help but recall the famous Sangam age Tamil poem, Red Earth And Pouring Rain. Arising at the crack of dawn, we set off for Ta Nei, a temple dedicated to the Buddha, in thick forest, but very easily accessible, via a sandy path. It was at Ta Nei that we got the first glimpse of how nature has in so many places overtaken the ruins in Angkor. 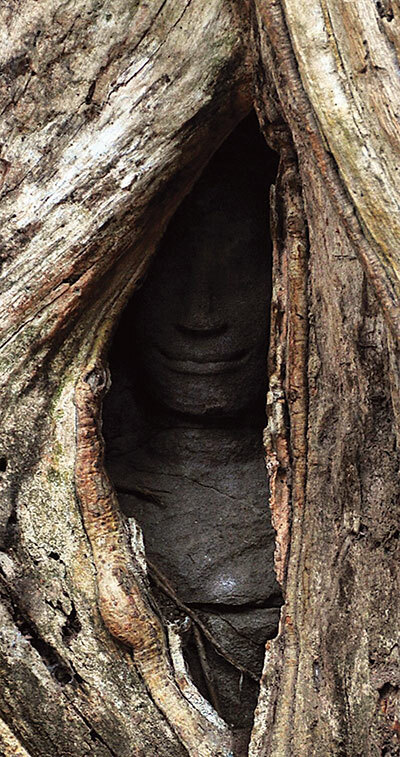 In many places tree and temple cannot now be separated. Nowhere is this more obvious than at the popular temple of Ta Prohm, once home to 600 dancers and several priests, lately famous because it was used as a location for Lara Croft:Tomb Raider. Writing on the fig tree of Angkor, in 1943, George Cœdès said: ‘The fig tree is the ruler of Angkor, over the palaces and over the temples which it has patiently pried apart; everywhere it unfolds its smooth pale branches, like the coils of a serpent, and its dome of foliage.’ It was here that we took a picture of an apsara peeking out between the veils of roots – it seems she was completely visible in the 1920s! Angkor Thom (Great City) was built by Jayavarman VII, at the centre of which lies the Bayon, probably the most well known temple after Angkor Wat. The Hindu myth of Samudra manthanam, the churning of the ocean of milk, was popular in Angkor, and there are spectacular representations of this myth, on the roads to Angkor Thom, with giant devas and asuras lining the causeways, holding onto the enormous serpent king, Vasuki, who was used as the churning rope. 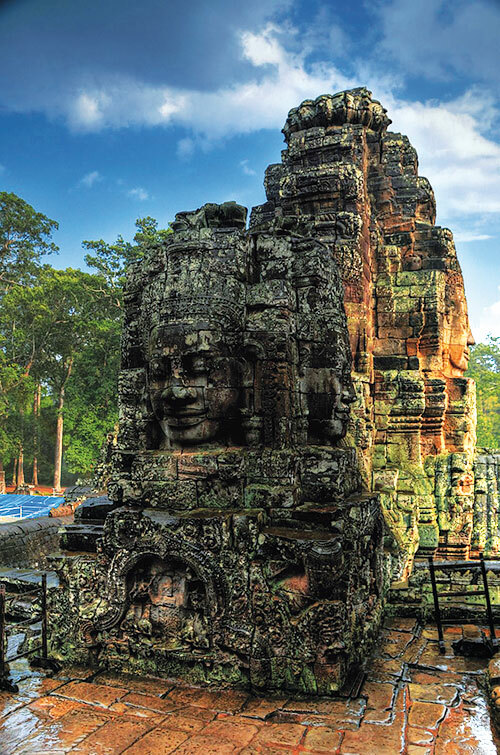 The gates of Angkor Thom add to the majesty, adorned as they are, with large Buddha- like heads gazing benignly into the distance, a slight smile playing on their lips. The faces on the gates may represent the king or the Buddha – or both. Inside Angkor Thom, not making our way directly to the Bayon, we went to Preah Pithu, a group of five small monuments, one Buddhist and four Brahmanic, via the unused East Gate, the ‘gate of the dead’. The magnificent Bayon looks at first like a massive pile of rubble with cracks running through it. As you get closer you note the sea of beautifully calm faces, carved to express benediction and peace. The intricate bas-relief carvings represent historic, mythic and everyday scenes. The Bayon began as a Mahayana Buddhist temple but was added to, defaced, and modified by later Hindu and Theravada Buddhist kings. While we were there, a thunderstorm struck, trailing clouds through which fingers of golden light bathed the serene faces in mysterious crepuscular light. The storm receded, and so did we, in the honeyed light of the sunset. Like hundreds of other tourists, we rose early to explore Angkor Wat and watch the sun rise over it and reflect in the adjacent pools. Built during the reign of Suryavarman II, the temple complex was dedicated to Vishnu and was later used by Theravada Buddhists, who use it to this day. The Wat (temple) sits like a grand old lady with a fancy hairstyle, surrounded by shimmering lakes and lush green grassland. Situated within a beautifully maintained moat, Angkor Wat represents Mount Meru with the addition of galleries, reminiscent of temple architecture from South India and Orissa. Detailed bas-friezes depicting scenes from the Indian epics, the Mahabharata and the Ramayana, apsaras, the churning of the ocean of milk and Vishnu, adorn the walls. Particularly impressive is Bhishma, lying on his bed of arrows. We spent the morning wandering around, watching the mynas land on stone naga heads. Prasat Kravan, set in neat gardens, is different from other Angkor temples built in stone, containing some beautiful and unique brick sculptures of Vishnu as Vamana with Garuda, (Garudas are an ubiquitous feature in Angkor) and Lakshmi, carved with Khmer features. 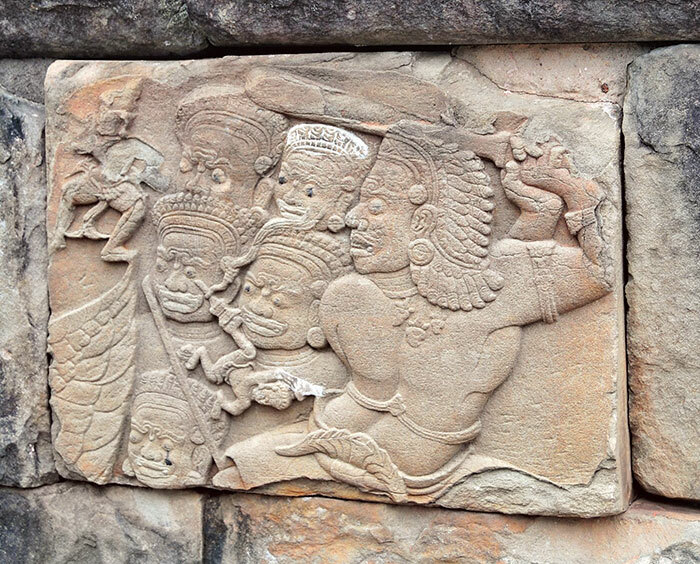 Preah Khan, or the monastery of the sacred sword, combined several functions, that of temple, university and residence. In this sprawling space it is worth looking for the hidden statues of Jayavarman VII’s wives, Jayarajadevi and Indira Devi, two very remarkable women, who can be found in small (easily-missed) grottos. The former was a devout Buddhist and the latter headed the Khmer university; inscriptions record her as the ‘chief teacher of the king’. 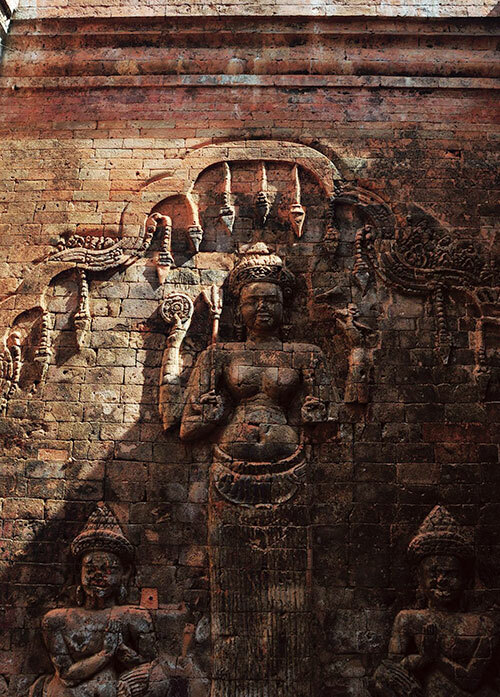 The diminutive but elaborately carved Banteay Srei, is popularly known as the Citadel of the Women. Dedicated to Shiva, built of red sandstone, it is an unimaginably romantic and intimate sacred space, exemplified by the carving of Shiva sitting under a tree and cuddling Parvati. Get There The best way to get to Siem Reap from India is to take a connecting flight from Bangkok. Thai Air International and Bangkok Airways fly from Bangkok to Siem Reap. Stay Hotels are plentiful, with one to suit every budget. Recommended ones at the top end include Amansara, Hotel de La Paix and the Raffles. Eat Cambodian food is delicious and distinctive. 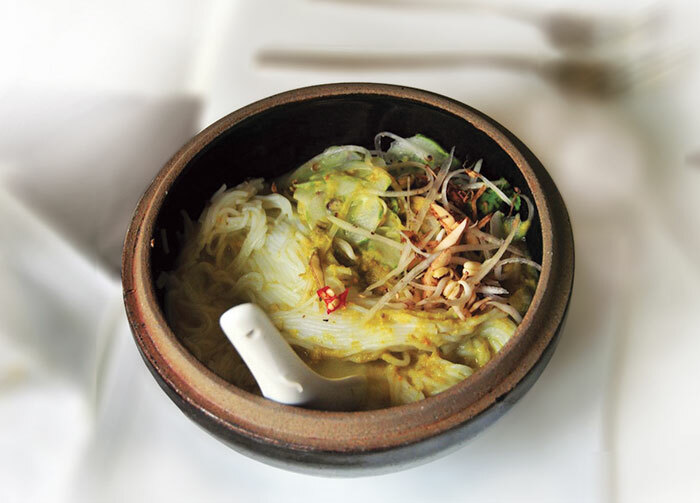 Places to eat include Café Indochine, Khmer Kitchen, Viroth’s and Sugar Palm. Shop Les Artisans d’Angkor, Neary Khmer Beauty Shop for silks, Angkor Night Market (for souvenirs at bargain prices) and the Old Market.